seasonshopping2016 has no other items for sale. Great transaction! Two thumbs up! Very happy with my purchase! This came in a chincy smashed box labeled in Chinese, and I thought I'd blown $10. I was wrong. For $10, this thing is surprisingly solid, and well made. It is easy to adjust, and attaches quickly to a scope, or spotting scope. For $10, you can't go wrong... heck just to have a good tripod adapter for your iphone is worth $10, and the phone holder is threaded, so it can be taken off the scope mount and attached to a tripod base. I would recommend this to anyone with a smart phone. The free shipping took about 2 weeks, but if you aren't in a hurry, that's no big deal. Easy to use but does not work quite as described. When attaching to scope the visual on the phone is not even close to what is pictured. Your phone either wants to focus on the crosshairs or the object you are focusing on. And the phone is right on top of the scope so the view through the scope is cut off and you have to zoom in on your phone to make it work. It is still functional but takes a while to find a happy medium that can work. Not good for i-phone 6s plus due too Camera location on phone, I'm sure works with other phones that has a camera built in the center.. could've been designed better. 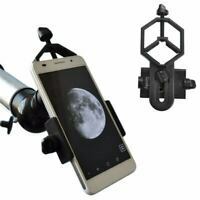 I was going to make sort of this same thing, but different out of aluminum and was looking at how others solved the problem of connecting an iPhone to my telescope. I looked at commercially made devices that cost 60-80 bucks and decided to look this up on eBay. What I saw was interesting and much cheaper than elsewhere, almost too much cheaper if you know what I mean. I figured that they were made of plastic but ordered one just to check it out. Wow I was surprised ! These things are very well made out of powder coated aluminum not high end machinery great but much more than necessary for the task. Oh did I mention that it took less than a week for the free shipping. 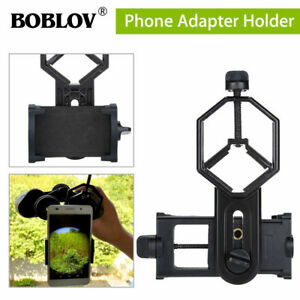 Fully adjustable for a wide range of cameras and eyepieces or binoculars and whats more, the camera clamp can be removed and has 3 tripod mounting holes for standard 1/4-20 tripod threads. The price of just this part is well worth it. Put your phone camera on a tripod. I was so thoroughly pleased that I immediately ordered another. Maybe more for gifts?? Great device, great price and great customer service. Doesn't get much better. I bought this because it was pretty cheap ($8.30) to try on rifle scopes. It didn't turn out to work as I had hoped but it's still a decent product. I'm sure it'll work fine for telescopes or spotting scopes. Rifle scopes require a specific distant from the lens for eye relief and the mount doesn't allow any of that. Still a cool product but just not for what I had intended it to be used for.